A number of years ago Lee Hersch and I began working to coalesce the consulting ideas we regularly share with business people. We found that as psychologist consultants there were “fundamental” notions we kept repeating through each consultation process. 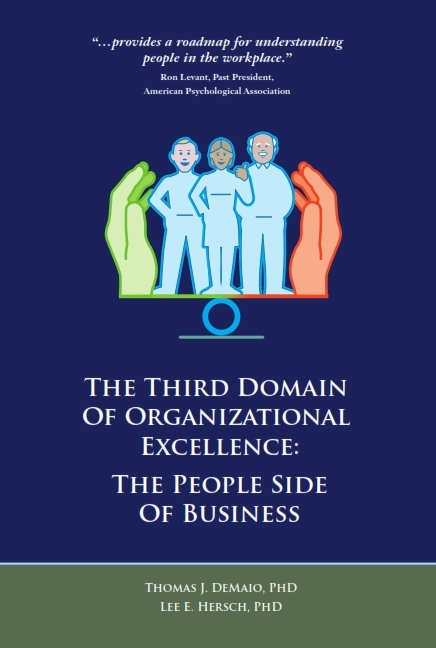 We also realized that we were talking about the third domain of organizational excellence. Almost everyone we worked with was a specialist in business and in their unique product or trade. Few of those same business people had trained in how to effectively manage and lead the key component of their business – their people. So, we have constructed a kind of psychological primer for business people. It contains what we believe to be the six essential psychological principles needed to manage and lead. The principles are based on the notion of accepting the way humans are designed and building systems that work with that design. People need to be nurtured, tend to work from a family-like perspective, and should be encouraged to develop and grow. They also need limits, guiding rules, and rewards – structure – to produce at peak performance. Utilizing these principles requires that one manage with a balance of support and structure. Finally, managers and leaders must appreciate that there are differences among people in how they respond to support and structure. To convey the principles in context, and to provide a case vignette, we constructed an engaging story about a new CEO. He realizes that there are personnel problems in his organization and must learn the six principles to solve them. The book is filled with work characters you see every day in your workplace. The book is now available through Amazon and other fine retailers.